BURLINGTON, MA, Dec 1, 2016 – COMSOL Conference 2016, brought together thousands of simulation experts around the world to share their modeling and simulation work. Users of the COMSOL Multiphysics software and COMSOL Server product contributed with hundreds of papers, posters, presentations, and keynotes highlighting engineering, research, and simulation apps. The user presentations are available in an open-access resource that covers the latest in a diverse range of electrical, mechanical, acoustic, fluid, heat, and chemical applications. 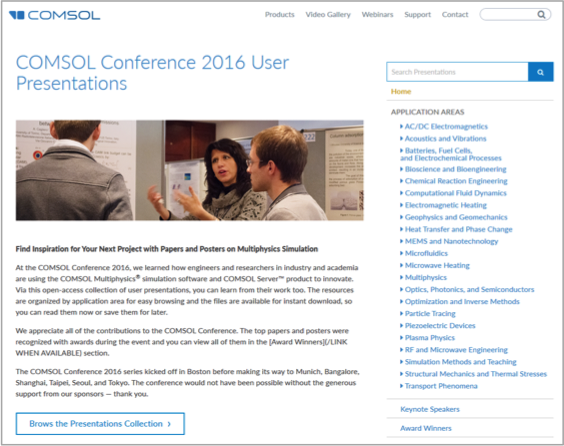 The COMSOL Conference 2016 User Presentations resource is available at www.comsol.com/2016-user-presentations. “Simulation and Testing of a Tunable Organ Pipe for Ocean Acoustic Tomography,” by A. K. Morozov, Teledyne Technologies Inc. Award-winning user presentations from COMSOL Conferences 2016 are available here: www.comsol.com/2016-user-presentations/award-winners. The COMSOL Conference 2016 was also held in the following locations Shanghai, China; Taipei, Taiwan; Seoul, South Korea; and Tokyo, Japan; papers and posters will posted online from these events as they become available. To view all of the 2016 COMSOL Conference user presentations visit: www.comsol.com/2016-user-presentations. COMSOL is a global provider of simulation software for product design and research to technical enterprises, research labs, and universities. Its COMSOL Multiphysics product is an integrated software environment for creating physics-based models and simulation apps. A particular strength is its ability to account for coupled or multiphysics phenomena. Add-on products expand the simulation platform for electrical, mechanical, fluid flow, and chemical applications. Interfacing tools enable the integration of COMSOL Multiphysics simulations with all major technical computing and CAD tools on the CAE market. Simulation experts rely on the COMSOL Server product to deploy apps to their design teams, manufacturing departments, test laboratories, and customers throughout the world. Founded in 1986, COMSOL employs more than 480 people in 21 offices worldwide and extends its reach with a network of distributors. For more information, visit www.comsol.com. This entry was posted in CAD-CAM-CAE on December 1, 2016 by Sharmila Guha.